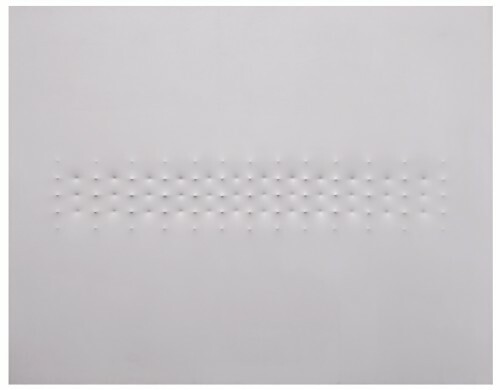 Enrico Castellani (born August 4, 1930), one of Italy’s most influential artists, is an Italian 20th century painter associated with the zero movement, Movimento Arte Nucleare and Azimut. Castellani contributed the development of avant-garde art in Europe in the 1950s and 1960s. Castellani was born in Castelmassa located in North-Eastern Italy. He studied sculpture and painting at Académie Royale des Beaux-Arts in 1952 and architecture at École nationale supérieure des Beaux-Arts in Belgium (1956). He is best known for his “paintings of light” that merge art, space and architecture to transcend the confines of painting. In 1956 Castellani returned to Italy and met artists like Lucio Fontana and Piero Manzoni who were pushing Italian avant-garde art. Castellani has exhibited at the most renowned institutions in the world including the MoMA and the Solomon R. Guggenheim Museum, New York; Centre Georges Pompidou, Paris; Stedelijk Museum, Amsterdam; Palais des Beaux Arts, Brussels and he has represented Italy at the Venice Biennale. He has had retrospective exhibitions at Pushkin Museum, Moscow, Russia; Kettle’s Yard in Cambridge; the Miuccia Prada in Milan; The Modern and Contemporary Civic Gallery in Latina in Trento; and Palazzo Fabroni in Pistoia. Castellani was the 2010 recipient of the Praemium Imperiale for Painting , the first Italian artist ever to receive this honor.